We’re so excited to spend our first Christmas in our new-to-us old house this year, but wow, is it different. 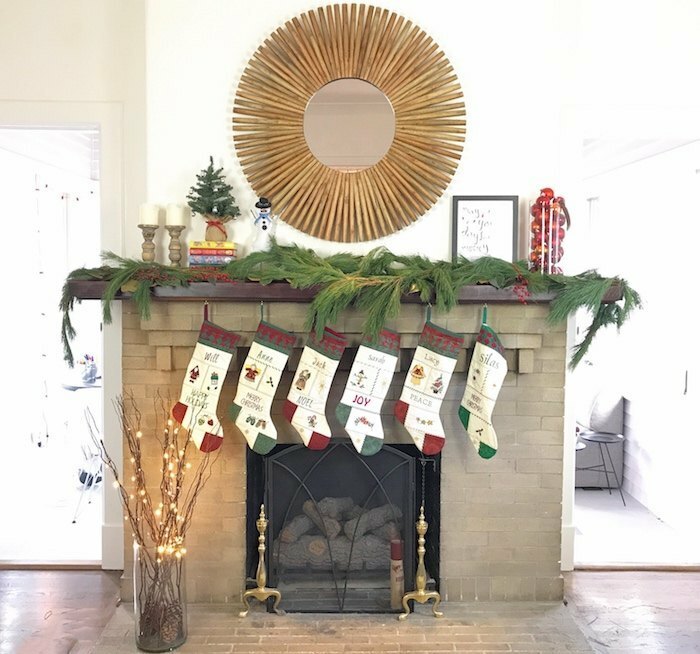 We love our new place and feel very settled in, but then the holidays arrived and I realized that we had some decisions to make to get our home ready for the holidays, since this year’s space is very different from the place we were before. We moved in February to a hundred-year-old Craftsman, and that’s a big change from the more contemporary mid-century home we moved from. In our new space we have a very neutral palette—literally every wall is painted Benjamin Moore’s Simply White. When we got out our Christmas decorations, many of them felt really loud in the new, neutral space. We needed to try something a little different this year. 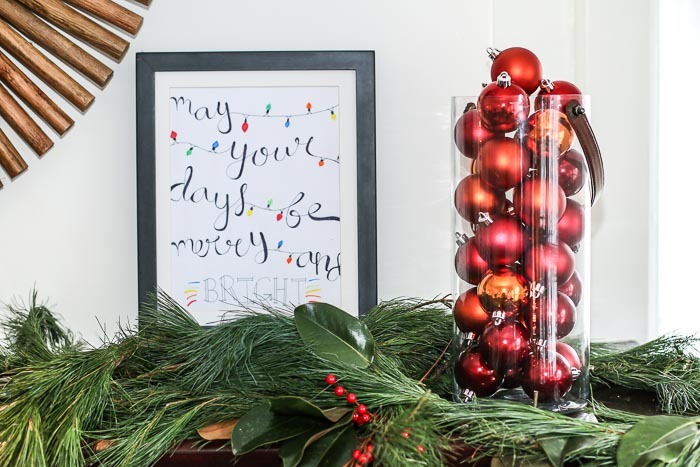 I wanted to spruce up my home for the holidays on a tiny budget, and I wanted it to be easy because this is such a busy season. So when RetailMeNot invited me to use their holiday deals page to see what I could find (and to give away a $300 Visa gift card to one lucky reader! ), I was delighted to give it a try. It’s basically a search engine that shows you the best deals at your favorite retailers, all in one place. I’ve been using RetailMeNot for almost a decade. I found out about it from an Ann Taylor employee, who told me her customers used RetailMeNot to find the best coupons and promotion codes before checking out. I’ve been using the site for so long I didn’t realize RetailMeNot now has an app, and that in addition to coupons, RetailMeNot now features thousands of deals, cash back offers, and discount e-gift cards, making it easy to save at all your favorite places, whether you’re shopping online or in a store. It’s easy to use, so you can keep your budget in line and keep your focus on what really matters this time of year. I visited the RetailMeNot holiday deals page and found all sorts of offers at stores I know and love, like World Market, Hobby Lobby, Crate and Barrel, and Target. When you shop online, you can combine coupons and cash back offers. Like at World Market now has a 10% off coupon (15% if you’re new to their mailing list) + a $20 cash back offer available. I found these great willow string lights there (already half off! ), beautiful wood bark bowl, and I stocked up on half-price batik-print linens in store after the RetailMeNot app alerted me to the sale. World Market is one of my favorite places to shop for stocking stuffers and I was happy to have an extra coupon to use. 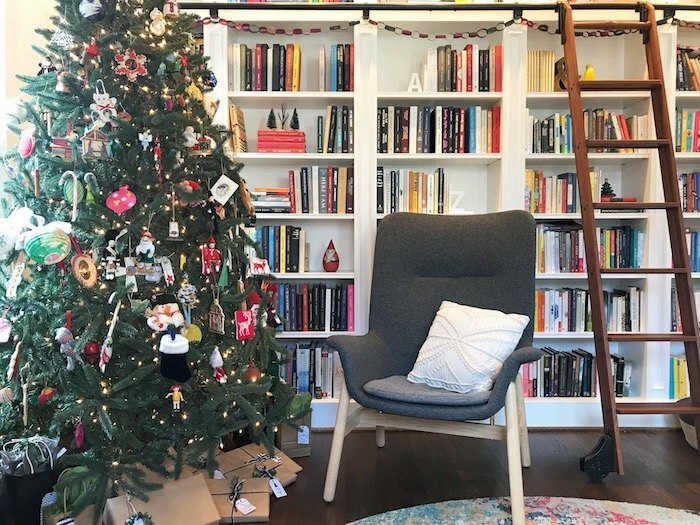 In our new place, I wanted to focus on the high-impact areas for holiday decorating: the living room and the library. 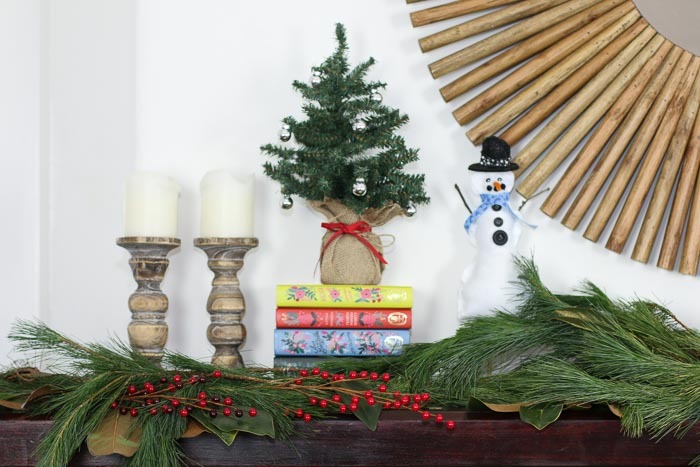 In the living room, the mantle takes center stage, so I visited Hobby Lobby to find greenery. I use faux greenery to add extra oomph to fresh displays, and I rely on it completely when fresh isn’t available. I found lots to choose from at Hobby Lobby. RetailMeNot has a 40% off coupon available, plus a $5 cash back offer. I love tucking their red berry cluster stems and magnolia leaf sprays into a basic garland to add color and texture. I adore magnolia leaves and am thinking about this magnolia wreath for our front door. Since it’s our first Christmas here, we had to figure out where to put the tree. There wasn’t an obvious place to put it, and the library was our third choice, but now that it’s here, I really love it. We spend a ton of time in our kitchen, so I wanted it to look festive, but I didn’t want to spend a ton of time or money on decorations that we could only use for a month. 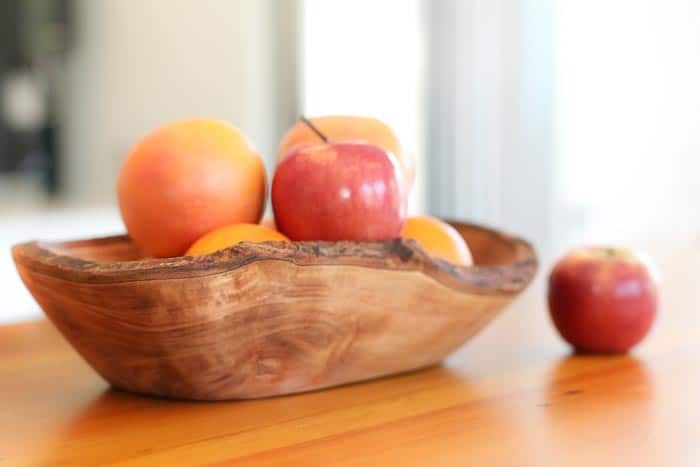 I prefer to buy pieces we can use year-round and fill them with seasonal goodies, like this beautiful wood bark bowl I got at World Market, full of in-season fruit. When I was at Target last week, the RetailMeNot app alerted me to great sales and deals in-store, and I found this freshly-clearanced shallow marble bowl. I thought it would look beautiful against my wooden island. I filled it with oranges and pomegranates (plus one pomander—my first! ), added a few sprigs of greenery I clipped from the yard, and it looks festive and practical. 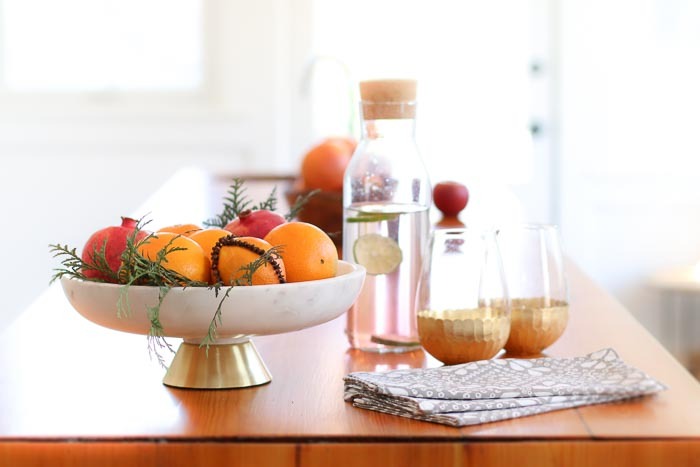 You can also see some of my favorite World Market finds on the counter—the beautiful, inexpensive linens, and their striking gold stemless wine glasses. I’m happy with how nice the house looks, and how little I was able to spend. Much love to RetailMeNot for their help with that, and I’m excited to help one of you with your shopping, too, so don’t forget to enter the giveaway for the $300 Visa gift card! To enter the giveaway, click here to sign up for RetailMeNot browse their website and comment back on this post with the deal you’re excited to use for holiday shopping this year. And don’t forget to download the RetailMeNot app to save on everything! UPDATE: The giveaway is now closed. Thanks for participating! I would love a gift card to World Market. You never know what you might find there! I’ll be using the 15% off at World Market. I always finish my stocking stuffer shopping at World Market and was already headed there today! I was there a few weeks ago and definitely thought it was a great place for stocking stuffers – I don’t go there often so I had no idea and feel like I’ve been missing out for years! The 15% coupon is definitely awesome. I love the 50% off at Talbots! I am looking for something special (sparkly!) to wear on Christmas. Thank you for this opportunity! 50% off at Talbots! Definitely one of my favorites for work clothes. Free $10 Gift Card With $50 Clothing Purchase from Target is a great deal! Thanks! The Talbots sale was a great tip off! I love retail me not, and have my eye on a belt at Talbots for awhile now. I need to freshen up my wardrobe, so the 50% off at Talbot’s would come in handy! How to choose! The World Market discount is fun, plus Amazon, Costco, and all the other places I already shop. Thanks for the scoop on this! I looked at the last minute Christmas gifts on Amazon and found the Keurig I’ve been looking for $30 less than anywhere else I’ve seen! WhooHoo! I’m excited about the Amazon Warehouse deals!! Love World Market–there are no stores close to me so I shop online. The 20% off and cash back offer at Barnes and Noble looks great, but I’ll also have to check out World Market. I haven’t shopped there before, but need some ideas for last minute stocking stuffers. The 30% off gifts and holiday coffee at Starbucks will help me finish cross those last people off my gift list. Thank you. Anything amazon or travel related! Your home looks fantastic! I love the world market deals on retailmenot! Oops just left a comment on the wrong post. So here goes again. I love snapfish. I am working on photo books of the grandkids for their high school graduation. I have a lot of photos of them that their parents don’t have. Thought it would make a great keep sake. Ill be using the $10 off $30 at Bath and Body Works! And probably $10 off for Uber Eats, because I’m really not into cooking these days ? Target winter accessories deal – gloves are the one thing in my house that consistently disappear. Like you, I’ve been using RetailMeNot for years but had no idea about this new service/site! This is awesome! I love that they have gift card deals because those are my go-to for last minute holiday gifts. Thanks so much, Anne! There are a lot of places I shop at regularly so these savings alerts and coupons are really helpful. World Market is one of my favorites online! Wow! Wow! Thank you! 89% off of an eBay refurb computer for my daughter… homeschool / Xmas list. Fingers crossed. Or $500 off a Costco computer. I can’t decide if I would get a gift card (I could go with Netflix to get a little discount on my streaming) or use coupons – probably both! I wish they had better coupons for Menards, though! I might need to use some of these Lowe’s coupons for my big spring project! I love this! Your home looks beautiful. I signed up and will definitely buy some faux greenery from Hobby Lobby for my mantel. I used real greenery this year and it doesn’t look like it’s going to make it until Christmas! Thank you for sharing! This is great! I did NOT know that RetailMeNot has cash back offers! Hooray! 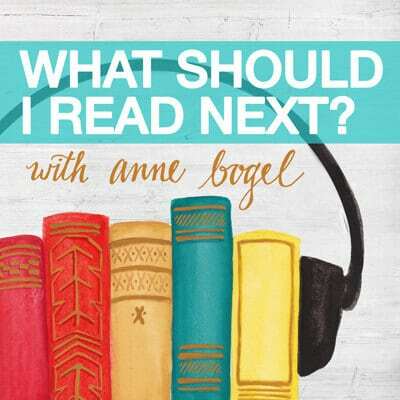 I have my eye on that B&N $10 cash back when you spend $50 offer. I just discovered the RetailMeNot cash back offers this season and thought they were too good to be true. I was happily surprised when I discovered that I was wrong! I’ve already received 3 cash back rewards. I only wish it were easier for me to remember to search for them before I make an online purchase. Amazon is my go-to site for shopping, and I’ve forgotten too often that RetailMeNot usually has cash back available for Amazon too. I’m excited about the Talbots deal! I signed up and added the app to my phone! The 15% off World Market deal is the one I’m most excited about for stocking stuffers and decor. The JoAnne’s by me is right next door to World Market, so that will probably be the next stop. I had no idea RetailMeNot had in-store offers, too, so I’ll be using this one quite a bit. The 13% off on Overstock is enticing. They have such a huge selection! Yankee Candle and Hobby Lobby makes my days merry and bright! I’ve never used this app before but have downloaded and will check it often. Thanks Anne! The Amazon warehouse deals look great!! #Dealbrag I just downloaded the RetailMeNot app and found 30% off 1 full-priced item at Pink, which is where I promised to take my daughter for Christmas onesie pajamas. Perfect timing! I need to buy bedroom furniturte for two people who don’t have any. I could use some help. I would love a gift card from IKEA. I’m excited about 20% off at Bed Bath and Beyond. My nephew used to work for RetailMeNot, so I’ve been using their site for years. My favorite deals are always at Dorothy Perkins, a store I fell in love with while in London, which now ships to the USA. They have a gorgeous olive green wrap coat with a 25% off deal on RetailMeNot! 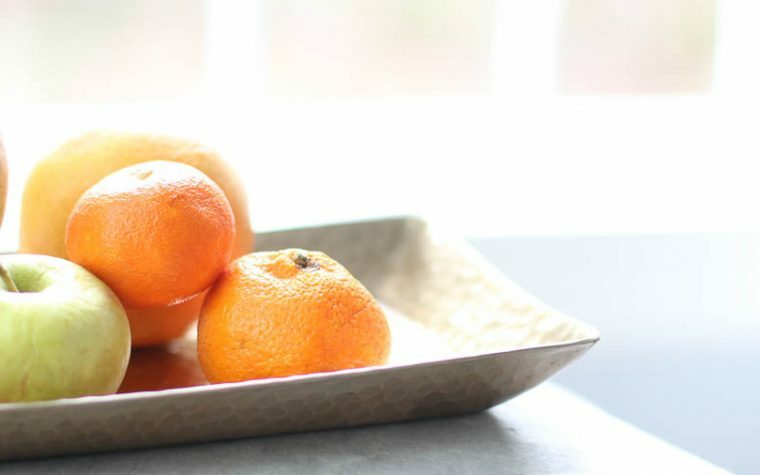 50% off clearance at Crate and Barrel. The holiday items are already on clearance so I need to stock up before we host Christmas for our family next week. I see new holiday decorations and dishes in my future! Hi. I love your stockings. Would you mind sharing the source? Thank you. I’m going to Ikea today & I was glad to see that $25 coupon! Wahoo! I’m loving the 15% off at World Market. We really, really need a new rug. Lord & Taylor. I miss that store. Deals at Macy’s are always my go to from Retail Me Not! Definitely World Market and Target deals!!! I’m excited to see 40% Off Sitewide at Gap Kids…my son keeps outgrowing his clothes, so we need a winter wardrobe refresh! World Market of course. How I wish we had one near by. Thank goodness for the internet. I have all of my christmas shopping done – does that mean I get to shop for me now? Can’t go wrong with home depot – I feel like I’m constantly updating things in my home (perpetual renovations) and discounts are always welcome! Like you, I’ve used RetailMeNot for years, I do have the app! My favorite is to find online coupon codes, but I’ll use it for in-store, as well! The alerts are exciting. I signed up..so much to see. Love the book stuff but I think my first stop is Best Buy!!! Thanks Anne! Would love to win gift card. I’ve been looking for a sweater to wear to the various holiday events we have on schedule. The 50% off deal at Talbot is perfect. I love RetailMeNot too! I’m hoping to use it for Starbucks since we always treat my MIL to GOOD coffee each Christmas. They have 30% off holiday gifts and coffee! Love Retail Me Not – I try to always remember to check the app before I purchase anything. Right now I’m loving the coupons for Kohl’s. I never knew about the app!! I would like to use one of the amazon deals for either the led lights or the projector. But there are so many deals to choose from. I’ve been doing a lot of shopping at Old Navy lately, so $20 cash back there looks great! I am excited about the Macy’s deal for $10 Off $25+ Or Up to an Extra 20% Off Select Sale Items. Oooooooh I love those stemless wineglasses! And the bark bowl! So pretty!!! 40% off baking supplies like cookie sheets at Williams Sonoma right now was a great tip. Headed there today to get a few things! The 50% off at Talbots is a popular choice and a good deal! I, too, have been using RetailMeNot for years. I can’t imagine shopping without it! If you don’t have the app, you’d be crazy not to download and use it. I couldn’t begin to guess how much money it has saved me. The AC Moore deal looks pretty good! I have been using it all weekend and just found another deal at Shutterfly! Ordered some photo books! Talbots for sure! I need a new winter coat! Merry Christmas to you! Your house is beautifully decorated. I love World Market and had no idea RetailMeNot had a deal for them – thanks! I’d love to use the Talbots deals. I sure could use a good new dress coat. Mine world be a toss up between the World Market and The Body Shop. Thanks so much for this opportunity! My boys need some new pants, so that 50% off at Gap is great! I want to use the 15% off at World Market, I love their stuff! I’m excited to use the Shutterfly coupon. I really need to get my pictures organized into books!!! The discount gift cards! I didn’t know they did that! the deal i saw that i liked is up to 60% off american eagle! How awesome!!! I’m excited about the 25% off of ebags.com. They always have some great stuff! I love Retailmenot too! I’m excited about the 40% off JCrew! $30 off at Home Depot? Yes, please. I loved using it for 15% back on Snapfish! Oooh, a Boscov’s gift card! I bought a tan purse there this summer and would love to find a similar one in a darker color for winter! I already was going to place an Ulta order. Then I checked out RetailMeNot and found a $5 cash back plus a 20% off coupon. Score! I want a Barnes and Noble coupon! I love Famous Footwear 15% Off + Free Shipping deal. Where wouldn’t I use it — that’s a shorter list. Target and Amazon stand out for me. I can see this app coming in very handy all year round. 30% off home at Target – we are desperate for sheets and I can treat myself to some Christmas towels too! So many good deals – it’s hard to choose! I’ll take 50% off Talbots to start off! I am loving the World Market and Target deals! Those willow branch lights — beautiful! Walgreens 40% off prints! I have a few pictures I need to print for gifts. I love the Shutterfly deals! We take so many family pictures during the holidays that the 28% off will come in handy ordering multiple copies for the family! Oh, man. I know this is kind of terrible, but I use Retail Me Not all.the.time for Papa John’s pizza because there is *always* a promo code, usually 40-50% off. I’m sure we’ll end up doing that over the holidays, but since that might not be the kind of holiday shopping you mean, I’ll say that I am also excited about the World Market deals! There are a few really nice Ann Taylor & Macys coupons! For me the best deal is the 20% off a purchase of $50 or more at Barnes & Noble, because than I can load up my nook! I am excited about the 30% off coupon to khols! I’m definitely going to use $20 of $40+ at CVS! Ann Taylor deals would help me maximize some store credit that I have!! I love the 50% off at Talbots. I need to do a Target run for last minute stocking stuffers plus get some LEGO for my youngest son, so I was happy to see several Target deals (especially the 20% off of select LEGO)! I would love to buy some gift cards for Starbucks and Best Buy as gifts. I love that you can get them discounted it is like coupon savings without needing a coupon. The Amazon Warehouse sale deal looks great! Need a few things for the kids. Can’t wait to start using Retail Me Not. This is the first I have heard about it. Thanks! I definitely use RetailMeNot when shopping throughout the year, and I take advantage of deals at World Market whenever I can because I love that place! I love the Target buy $50 in clothes get $10 in gift cards deal! But there are so many deals to explore. Thanks for introducing me to the expanded RetailMeNot! I just joined and am adding the app to my phone. I’m planning on using the code for Amazon $5 off $15 for print books. Cash back at Amazon is always a plus!! I love RetailMeNot – I use the app frequently! I’ve also used their site for years! I’m excited to see the great deal on pajamas at land’s end. I always check for deals when I do my Christmas cards on Shutterfly! I love the Amazon warehouse deal and the target $10 gift card when you spend $50. So many good options! Those are just some of my favorites. The Target deals are always great. I also love the Shutterfly deals, use those make photo books for the grandparents. I’ve used retailmenot before but didn’t realize it had so many deals on items I’m already buying…I’m looking forward to some cheaper Starbucks! The 20% off at ultra will be a great help for buying those last minute stocking stuffers I need. I love the amazon warehouse deals! I also am looking forward to using snapfish to get all my holiday prints made to scrapbook! I have never used RetailMeNot but I plan to check out the Express deals tomorrow! Thanks for the giveaway! World Market all the way! I need to use the Macy’s to buy a new winter coat! RetailMeNot has always been my go-to for online shopping and printable coupons too. This season, I’ve used them for Kohl’s coupon codes and Bath and Body Works coupons to save big $$$! I’d use it on deals at Hobby Lobby! I’ve been trying to decorate my girls room on a budget all year and this would go a long way to add some fun decor! Hard to choose, Probably Home Depot or Lowe’s since we’re fixing up an old house. I have used a number of codes from there as I prepare for Christmas, snapfish, ten thousand villages etc. I will definitely be looking into their Ulta coupon and Barnes and Noble coupon. I’m looking to switch phone service carriers and I like the 6 Months of Talk, Text & Data for $1/mo deal at Virgin Mobile! Lots of savings there! The Carter’s coupon! My bff is having a baby girl in April after a long road of fertility issues! This “auntie” has some spoiling to do! Currently obsessed with adult coloring and coloring books so Amazon and Thrift Books deals are the best! Amazon is excellent for people like me who work abroad and so travel regularly! This is a great find. I signed up and am really excited about the deals at Cost Plus World Market and Target because those are my go-to places! Old Navy! I’ve been using Retailmenot for years! I’m loving Pottery Barn’s deals! 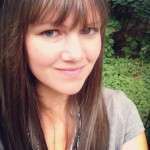 I am just excited about the retail me not app! Looking forward to my first purchase which will most likely be for one of the many birthdays we have every year for our children! Definitely the Barnes & Noble deal! I’m a faithful user of Ebates but sometimes forget about RetailMeNot. This season I tried to do better and managed $10 cash back at Best Buy and a few good coupons at Barnes & Noble and Target. What I didn’t realize is the coupons work in stores as well as online! So I’ll need to better about checking the app! Thanks for reminder! The Steinmart deal — I haven’t shopped there since we returned to Virginia and this is a good excuse to pop back in. I’m a Target junkie so their $10 gift card offer would come in handy. I’m excited about the 15% off code for JCPenny! Was planning on shopping there soon! Just knowing about the app is the deal update for me. I regularly use the site when shopping on the web, and I like how the app helps you see multiple deals at once. I was just in World Market! I didn’t know about the app! Just downloaded and now I’m ready to go back and use it. ? just need that gift card…. Used RetailMeNot to get 30% off at DSW! My 19 yo ss needed new boots! CVS $30 off order of $60+! Great deal. I am trying to teach myself to put on makeup correctly (I’m almost 30 and have never bothered to learn) so I am excited about the Ulta deals. Does it count if I was excited enough by the Land’s End deal that I’ve already used it, even before coming back to comment? Thanks to this I just used this to get my daughter a new sleeper for Christmas. I’d been half-heartedly stalking Land’s End but missed out on the promotion that RetailMeNot just pointed out. Thanks Anne! Macy’s has a lot of different sales plus up to $30 cash back! I love the wide variety of things they carry – perfect for finding a few last minute gifts for people all in one place. 30% off Home Items at Target will help me decorate our new-to-us home! We’re moving in a few months to a house twice the size of our current one and will have lots of empty spaces, so Retail Me Not will be great! 30% off at Fossil has my name written all over it! $10 back at Barnes and Noble – they can take all my money!! 50% Off Sitewide at Lucky is an awesome deal. The Vera Bradley 50% Sale! This is awesome! I love the peek inside your beautiful home–your decorations look great!!! I am excited, in true book nerd fashion, about the 20% off your purchase of $50 or more at Barnes and Noble (especially since my boss just gave me a gift card!!) Thanks Anne for the chance to win! Merry Christmas. I like the. Burger King and Virgin cell deals. I love the many Shutterfly deals. I love to make personal photo gifts and Shutterfly has a great selection. Now with these deals I can order more! Thanks Anne for telling us about RetailMeNot! I love the 75% off holiday dinnerware and serveware Macy’s is running. I love the 75% off sale Macy’s is having on holiday dinner and serveware! 75% off books for teens and children at Barnes and Noble? How wonderful! I think I would love to use the coupon at Barnes and Noble. I love a good book and adding to my TBR stack always makes me happy. 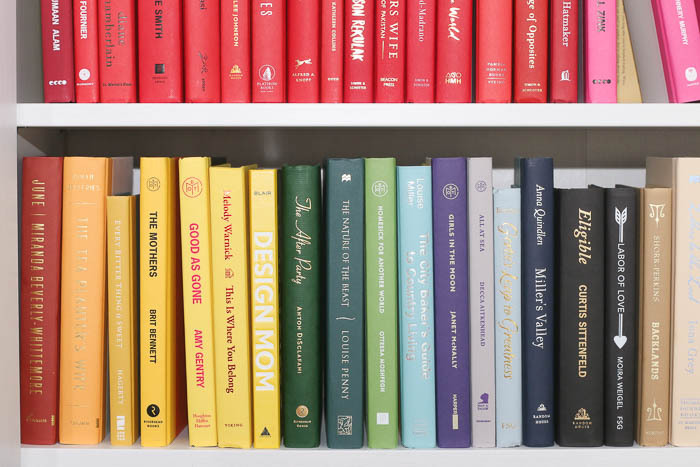 I have one reader and 2 not so much – so I tell myself that my stack is also a good example! I’ve searched Retail Me Not in the last looking for promo codes, but had no idea they had an app to streamline & simplify the process. I’m planning to use the Hobby Lobby coupon + cash back as well as Barnes and Noble! Thank you! Up to 65% Off Home Decor Clearance…great deal! Thanks for the chance. Merry Christmas! I would love to use the 50% off holiday clearance at Target to spruce up my decorations for 2018! I love 20% off Best Buy. That will come in handy. I would use the Kohl’s Extra 15% Off Sitewide to get deals on clothing for the kids for the holidays; thanks for the chance. I love the discount egift cards, especially for stores like Office Max where I know I’m going to be spending money anyway. How much to I love Boden dresses? A lot. Unfortunately, they’re often pricier than my budget allows. How great to find such a good sale through RetailMeNot! Wow! How have I been missing this! Excited to download the app too and get some deals on The North Face. Thank you! I use RMN every time I visit Michael’s. What a great site! The Amazon deals look great! 50% off Boden!?! Ooo… sign me up!!! I’m going to join the crowd of people who are excited about World Market. I just love that store! I always find things I didn’t know I was looking for. It’s perfect for stocking stuffers at this time of year, too. My hubs & I just played the Golden Llama sweepstakes and each won a $50 gift card to spend in the store that day. It was awesome! I’m a huge fan of Retail Me Not. I always check for coupons there. I didn’t know they had an app, but I’m not surprised. I’m off to download it! I’ll be using the Bath & Body Works discount, plus the Bed Bath & Beyond discount for some last minute gifts! 20% off of The Container Store’s stocking stuffers?? Yes please! The Expedia discount coupon! Super good deal! I’ve been meaning to print family photos all year, so the CVS photo deal makes it seem a lot more manageable!